Based on the experience from conducting many corporate performance improvement programs, Prof. Dr. Edward Krubasik gives us an insight into the value creation chain via growth opportunities and restructuring through innovation through his upcoming public lecture. Through concepts and practical examples of innovation, productivity and growth programs, Prof Krubasik will show us in real-life examples on how to create value via growth opportunities and restructuring through innovation, management of technological uncertainty, value selling in account management, cost reduction and improved asset management. He will also share with us his experience on managing corporate crisis and how to recover or prevent such crises. Edward G. Krubasik, Prof. Dr. rer. nat., MBA, studied physics at the universities of Erlangen-Nuremberg and Karlsruhe in Germany. After obtaining a doctorate in nuclear physics and following research projects at the Stanford Linear Accelerator Center in California he completed an MBA program at the European Institute for Business Administration (INSEAD) in Fontainebleau, France. Prof. Krubasik worked as partner and director at McKinsey & Co., Inc. for over twenty years, where he was in charge of McKinsey’s global Innovation and Technology Management Practice and the European Electronics, Telecommunications and Aerospace Sector. 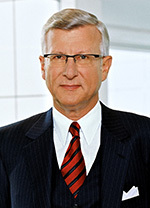 From 1997 to 2006 Professor Krubasik was a member of the Corporate Executive Committee of Siemens AG with special responsibility for the company’s Industry and Transport business sector and Siemens’ Corporate Technology Department. Within this time period he was in charge of a series of turnarounds, mergers and reorganizations as chairman of a series of global and regional Siemens companies, e.g. Siemens VDO Automotive AG, Siemens Dematic AG, Siemens Building Technologies AG, Siemens France SA and Siemens Belgium SA. On behalf of the Committee he was responsible for Siemens’ relations with the EU and represented Siemens in top positions in national and international industry associations. He has been active honorary professor in the MBA program of Technical University of Munich since 1998, is serving as Director in Residence at INSEAD, Fontainebleau, and giving courses for non-executive directors there. In 2016 he has been lecturing at Tongji and Fudan Universities in Shanghai. Registration for the session has closed. Walk-in participants are welcome to join us at the session.